ORDER CHABAD OF THE TRI VALLEY'S KOSHER COOKBOOK! 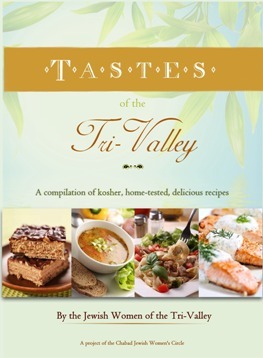 "TASTES OF THE TRI VALLEY"
This beautiful cookbook is a testimony to our warm and ever-growing Jewish community. Whether it's an elegant holiday dinner, birthday party, quick family supper, or a Shabbat meal - this cookbook is for you.